"I think that it's important to have something that will get 60 votes in the Senate; that means getting Democrats on board. We will have Democrats on board in the House as well," said GOP Rep. Jeff Denham of California, one of the discharge petition advocates who said he expects more lawmakers to sign on to the effort Tuesday. "I can guarantee you a discharge petition will not make law, so what's the point?" the speaker said. To a growing number of lawmakers, the point is that inaction on immigration is worse than taking tough votes in an election year. Retiring Pennsylvania GOP Rep. Ryan Costello signed the petition and said good policy isn't nullified just because it has support from Democrats. "If you get 200 Republicans and 100 Democrats or 50 Democrats, is that all of a sudden a bad bill?" Costello said. "I don't think so." But the petition is attracting support from more than just a small cadre of moderates. New York Republican Chris Collins was one of President Trump's earliest supporters in Congress and a backer of the conservative Goodlatte bill — and he signed the petition. Collins told reporters he signed with the hope that Republicans will rally around Goodlatte, even if the evidence suggests they won't. "It's a risk," Collins said. "For those of us who told our constituents we're going to fight for them, we can go back and say, 'While I'm disappointed something didn't pass, I'm fighting the good fight. I'm doing my best. I'm going to keep fighting the good fight.' "
"Every Democrat, I think, is supportive of bringing a bill to the floor that would fix and protect DACA," Hoyer said. "I'm hoping that we can get sufficient signatures to discharge a rule which allows for four different alternatives and allows the speaker to offer anything he wants. How much more open and fair and transparent can you be?" "I'm tired of defending nothing. Even if nothing passes, you've got to put forth the effort so you know where people are. Now that may be an entirely ludicrous thought but that's where I'm at," said Rep. Mark Amodei, R-Nev., who has signed the discharge petition. "Guess what: I'm not trying to sow discontentment or mutiny — I've just frankly run out of patience with, 'Yeah, we'll get to it.' "
Costello also rejected the political argument that pushing an immigration debate could further threaten the GOP's grip on the House majority. "I just don't agree with that because there's a lot of members in districts similar to mine, middle-of-the-road districts, where they're just looking for people to solve problems, and when you're willing to just have the courage to just go solve problems, voters reward you for that," Costello said. "It's going to have to be something that garners 218 votes. I won't get everything I want; moderate members won't get everything they want. Hopefully in the end we'll find a compromise," Meadows told reporters. 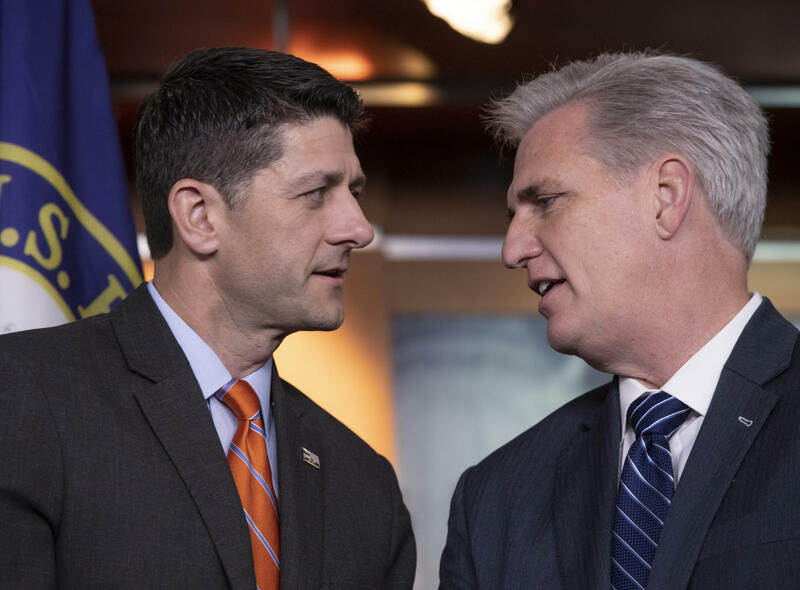 While lawmakers, including Meadows, continue to voice support for Ryan's leadership, the immigration debate may test not only his ability to stay on as speaker through the election as he plans but also the ambitions of the Republicans who want to move up the leadership ladder when he is gone: Majority Leader Kevin McCarthy, R-Calif., and Majority Whip Steve Scalise, R-La. Republican leadership elections are determined solely by sitting lawmakers, but outside conservative activists' groups are already calling for Ryan to step aside to let a new leadership team lead the House GOP through the elections. "Lame-duck leaders never help much. I think it's time for new leadership," said conservative activist Brent Bozell of the Media Research Center, a frequent critic of House and Senate GOP leaders. "I don't want to be overly dramatic here but it's not just consequential; I think it might be existential," he said. "Obviously, I serve at the pleasure of the members," Ryan said. "Those are the people who drafted me into this job in the first place, but I think we all agree the best thing for us is to complete our agenda and not wedge into the middle of the completion of our agenda a divisive leadership election." "I think it's precarious for the conference, it's not for him. It's extremely difficult. It's hard to come together around and we have different opinions, but you just have to keep working the issue and get there," he said. "Depends. If it's a majority of Republicans, no. If it's a minority of Republicans, yes," he said. There's a rebellion brewing in the House of Representatives. Conservative and moderate Republicans are battling it out over competing immigration legislation. Stuck in the middle is House Speaker Paul Ryan. He's trying to find some consensus that would hold the party together. How he navigates this may determine whether or not he can serve out the rest of his term as speaker. NPR's Susan Davis reports. SUSAN DAVIS, BYLINE: At a closed-door meeting this morning, House Republicans like Nevada Congressman Mark Amodei knew the speaker was feeling unusually frustrated when he used some rather salty language. MARK AMODEI: I think he said gee whiz and gosh, and he used the word crap once. For Paul Ryan, crap is pretty blue language. DAVIS: Frustration is what most House Republicans are feeling right now as the chamber wades into an unscheduled immigration fight this summer. It's exactly what Ryan was trying to avoid. Now the speaker acknowledges it's on him to find a way out that doesn't pit his majority against each other in the middle of an election year. PAUL RYAN: What we're trying to do is find where the consensus sweet spot is. It's a very difficult issue. Immigration is an issue that has a lot of passionate positions, a lot of passionate thoughts, and our members come from various different perspectives. DAVIS: On one end is House conservatives, who used their votes to take down an unrelated farm bill last week on the floor. It was a strategy to get leadership to agree to a vote on a more hard-line immigration bill. Conservatives want a border wall and tougher legal immigration policies before they'll agree to any paths to citizenship for people who came to the U.S. as children. And they want it passed on the strength of Republican votes. Conservatives like Ohio Congressman Warren Davidson argue that compromising on immigration would betray the voters that gave Republicans control of the White House and Congress. WARREN DAVIDSON: We know that what Democrats want us to vote on isn't what we promised voters to do and, frankly, is very different from what the president campaigned on. DAVIS: On the other end is House moderates, who are working with Democrats to use parliamentary tactics opposed by GOP leaders to force the House to vote on a different set of immigration proposals. Their end goal is to pass a bipartisan compromise that includes a path to citizenship in exchange for more border security. California Republican Jeff Denham is one of the Republicans driving the effort. Moderates like him argue voters just want a solution, and that only a bipartisan bill can ultimately pass Congress. JEFF DENHAM: I think that it's important to have something in the Senate that will get 60 votes in the Senate. That means getting Democrats on board. We will have Democrats on board in the House as well. DAVIS: Stuck in the middle is the speaker, who promised Republicans this morning that the House will now vote on immigration the third week in June. It's unclear what bills the House will take up, whether they can pass anything or if the Senate would act if they did. Republican leaders haven't brought up any immigration legislation in this Congress because they wanted to protect their vulnerable incumbents from taking tough votes on bills if they're not guaranteed to become law. Increasingly, those vulnerable lawmakers are the ones saying they want to take these tough votes. Here's Amodei again. AMODEI: I'm tired of defending nothing. Even if nothing passes, you've got to put forth the effort so you know where people are. Now that may be a totally ludicrous thought, but that's where I'm at. DAVIS: The one thing that is certain is that this is a political minefield for Paul Ryan. Even his staunchest allies like Oklahoma Congressman Tom Cole say passing a bill without most Republicans voting for it would be politically treacherous for any leader. TOM COLE: When you control the House, you don't let the minority in your own conference dictate what's going to pass. So we need to just keep working and come together on something that satisfies, at the minimum, a majority of the majority. DAVIS: For now, House Republicans are standing behind Ryan. He told reporters today a leadership race in the middle of an election year would only stand to hurt the party. RYAN: Obviously, I serve at the pleasure of the members. That's - those are the people who drafted me in this job in the first place. But I think we all agree the best thing for us is to complete our agenda and not wedge into the middle of the completion of our agenda a divisive leadership election. DAVIS: Whether or not Ryan can complete his work as speaker could be decided in June. Susan Davis, NPR News, the Capitol.